Ragdolls are appropriately named cats as they are bred for their sweet disposition and will often just flop over like stuffed toys when they are held or cuddled by people. These cats will usually be wherever their owners are as they are social animals. Ragdoll cats come in six colors, blue, cream, chocolate, seal, lilac and red. This variety of coloring makes them quite popular. Their bright, blue eyes and good natured personalities make these cats great pets for just about every type of family. Ragdoll cats have four color patterns: Bi-colored, mitted, van and colorpoint. Bi-colored means two shades of fur. Mitted means that the tail, facial mask, legs and ears are brightly colored while the front toes, the back legs and the chin are white. Van is when there is color only on the top of the head, on the tail and nowhere else on the body.Colorpoint means that the face, ears, legs, feet and tail are colored while the rest of the body remains white. This last is a genetic abnormality similar to albinism. The eyes of ragdoll cats are always bright blue. The ragdoll is a larger breed and often requires up to four years to reach its final size, with the males being somewhat larger than the females. The male ragdoll weighs from 15 to 20 pounds while the female weighs from 10 to 15 pounds. The ragdoll breed began in the 1960’s with mostly free roaming cats involved in the breeding program. 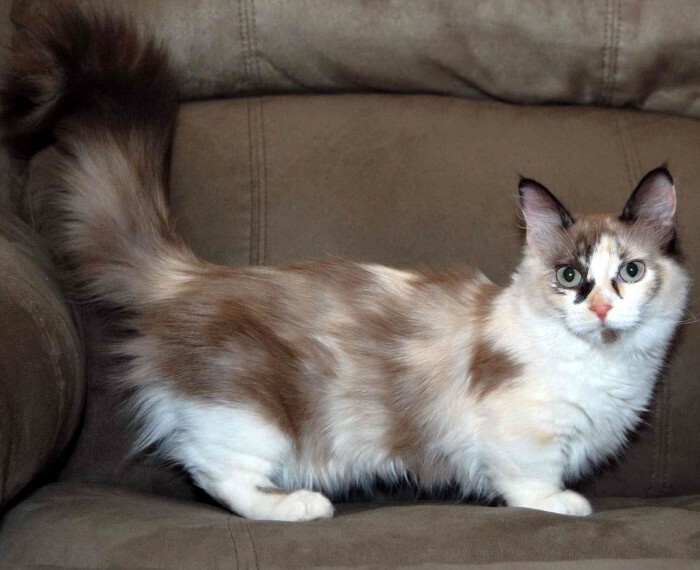 The originator of the breed chose a white, domestic long haired female with a sweet temperament and bred her with other homeless cats to create a good-natured breed of cat. The ragdoll breed was formed from careful selection of personality traits, making these cats very gentle. They often play without extending their claws, making them great pets for young children. The ragdoll cat’s coat is semi-long, silky and soft in texture and requires just a little grooming. The fur should be combed once a week with a steel comb, as this rids the coat of tangles and loose hairs. During the spring and fall shedding seasons the hair will fall out in greater abundance so more frequent combing is necessary at those times. The personality of this type of cat is legendary. These cats are easy to train and eager to please. They get along well with dogs and little children, love to be around people and can even be trained to fetch like a pet dog. Ragdolls can learn to walk on a leash like a dog and have an unusual willingness to do things to please their people. This, along with their laid-back demeanor, makes these cats extremely popular pets. These cats are sometimes called puppy cats as they actually act more like dogs than they do the typical cat. They don’t like to stay way up high like other cats do, and have a relatively low energy level. They prefer to be close to people and follow humans around much of the day. Click the images to see more of these adorable kitties.